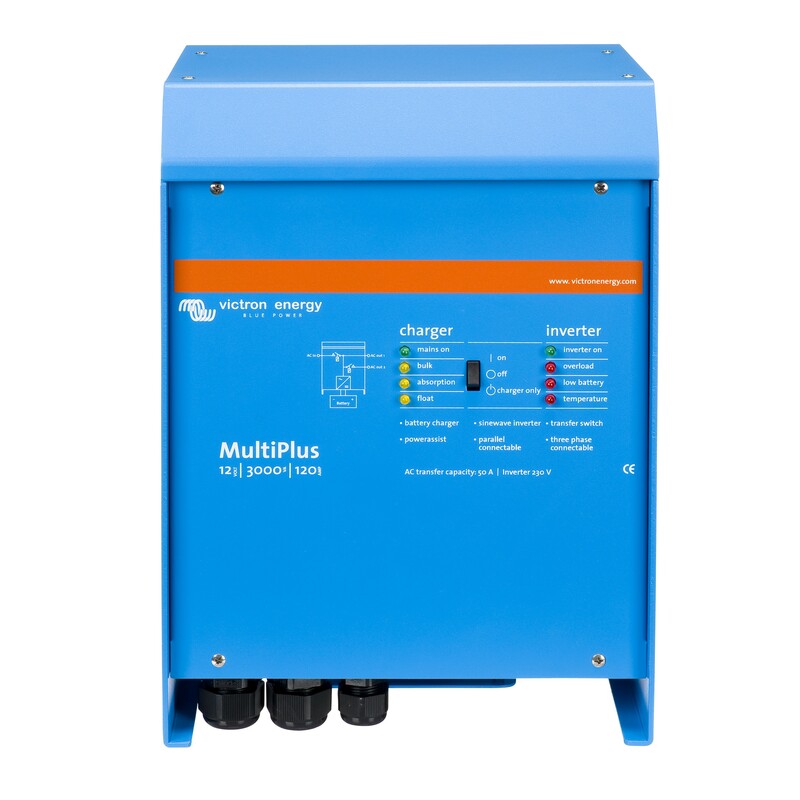 The MultiPlus is a combined inverter and charger in one package. Its many features include a true sine wave inverter, adaptive charging, hybrid PowerAssist technology and multiple system integration features. With its unique PowerAssist feature the MultiPlus inverters will prevent overload of a limited AC source, battery charging will automatically be reduced when otherwise an overload would occur. The second level will boost the output of a generator with power taken from the battery. In the event of a grid failure, or when shore or generator power is disconnected, the MultiPlus inverter/charger is automatically activated and takes over the supply to the connected loads. This happens in less than 20 milliseconds, so that computers and other electronic equipment will continue to operate without disruption. Multiplus features virtually unlimited power thanks to parallel operation - up to 6 MultiPlus inverters/chargers can operate in parallel to achieve higher power output. Three phase or split phase operation is also possible. Monitoring and control of your MultiPlus system is possible via the internet from anywhere in the world, using the free VRM app and free VRM portal website.